Updated: clarified that this is now available to all Gmail app users. Google today said the global Android Gmail app is set to add support for Microsoft Exchange. 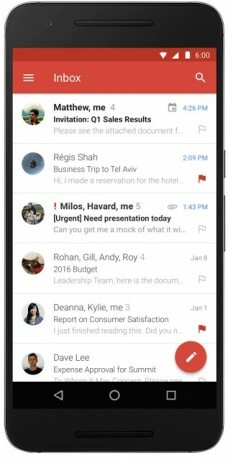 "Whether you're on Google Apps or Exchange, you can use the Gmail app on any Android device to send and receive mail," said Google in a blog post. Gmail will also be able to support Exchange-based calendars. Gmail has long supported the IMAP and POP email protocols, including Microsoft's Outlook and Hotmail services. Google added Exchange to Gmail back in November 2014, but only Nexus handsets running Lollipop had access to the feature. Providing Exchange support to all Android users is a big win for businesses that rely on Microsoft's email management product. Google says the updated app will be made available from the Google Play Store over the next few days. Google Lookout is a free app that uses AI to identify things it sees through the phone's camera and describe it to a visually-impaired user. The company announced this week that the app is available now for English speakers in the US with a Google Pixel phone. Microsoft today ported its Cortana personal assistant to its Skype chatting application, providing people with access to information without forcing them to leave Skype. Microsoft says Cortana in Skype can suggest useful information based on chat contents, suggest smart replies, manage schedules and/or reminders, and more. When I tried to add my work exchange to my personal Nexus 7 last year, one of the permissions was that work could wipe my Nexus 7 via exchange. No thanks. But MS Outlook for Android doesn't do that, so that's what I use.